The wait for the flageolet beans I ordered from all the way across the country was worth it. Up to the minute I put the first spoonful in my mouth, I was skeptical of the outcome of this white bean, artichoke, and goat cheese gratin. Despite my mind being opened to the concept of gratins that are more vegetable, less cheesy sauce, I always feel disappointed when I cut into a potato or zucchini gratin to find a pool of milky broth in the bottom of the pan, no matter how flavorful that puddle may be. This time, I disregarded the instructions in the original recipe to cover the beans completely with broth in this gratin, and instead added just enough to steam and melt the creamy layer of goat cheese blanketing piles of tender beans. When I pulled the dish from the oven, I could still see hot liquid bubbling away, but I shelved my disappointment and let the gratin rest for a few minutes while I readied ramekins and spoons for a late night casual dinner. Somehow, miraculously, after dressing some greens, almost all of the hot broth had absorbed into the beans, perfecting their tender bite, without leaving me to contend with the dreaded herbal broth hiding under that first scoop. After clearing that first hurdle came the realization that this was not any old dressed up pan of baked beans. Even though I haven’t been to France (or across any ocean), my first bite of hearty beans, warm goat cheese, and comforting bread crumbs all jumbled up together transported me to some rustic countryside. I simplified the recipe to use canned beans and artichokes, in hopes that more of you will be motivated to experience this dish, but it’s so true that using the best ingredients you can find, even in a simple gratin like this, has almost a transformative power. I guess I’ll have to follow up when I make it next time with canned beans and pre-purchased stock. No doubt I’ll still be tempted to go face-first into the pan, but I wonder if there’s a noticeable difference in taste because I used dried, “premium” beans, homemade stock, and olive oil that requires an extra trip on grocery day. What are your thoughts on the “better ingredient” debate? Do you go for the best you can afford, or is it your natural inclination to bargain shop? Do you splurge on a few “artisan” key ingredients every now and then? I’m very much a bargain shopper at heart, but I have to say, I think I’m starting to understand the taste value, and even intangible benefits (aka imaginary trips to the French countryside), of occasionally paying $6.00 in shipping to get a pound of beans from California. I don’t think anyone should go into debt over their grocery budget, and affordable, quality, fresh options are essential if we ever want a healthier country. However, it’s interesting to note that, in the U.S., as I’ve been reading, we spend only a tiny portion of our income on food. We just seem to think that, due to its necessity, food should be cheap. 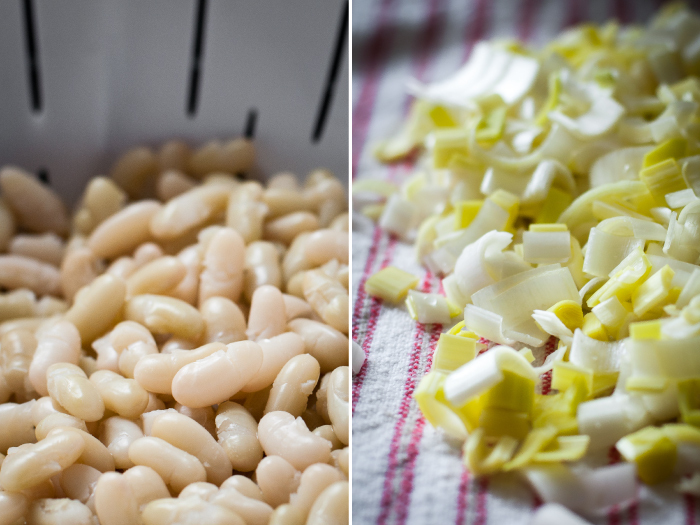 Sometimes, though, even if it’s not an every day or every week thing, it’s surprisingly satisfying to make a dish like this bean gratin from the best fresh ingredients. You might, like I did, even walk away with the feeling that it was money well spent. 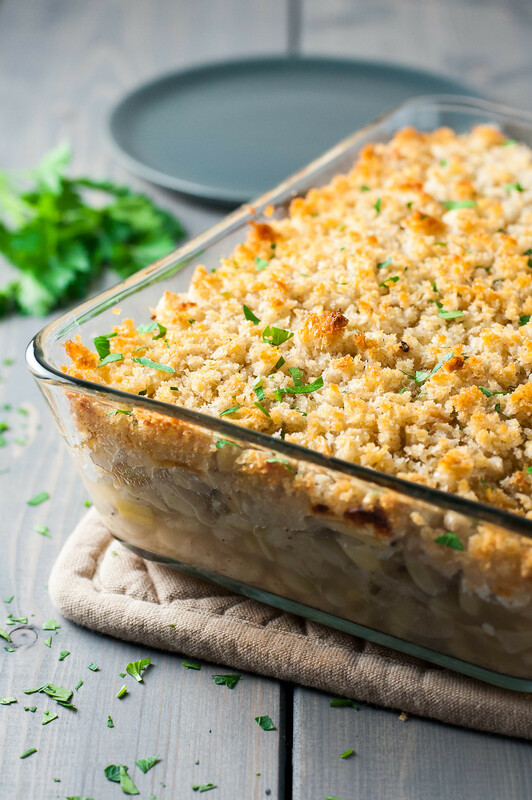 When served in ramekins, this gratin most reminds me of a protein-packed, sophisticated version of baked mac and cheese. Its humble appearance belies its rustic, hearty textures and flavors. Quarter the leeks lengthwise and slice ¼" thick. Soak in cold water in a roomy mixing bowl for a few minutes, letting any dirt fall to the bottom, then scoop out with a slotted spoon and dry on a towel. Cut the artichoke hearts into eighths around the center axis. Preheat oven to 400 (F). Melt butter over medium heat in a large skillet, then add leeks, garlic, and rosemary. Cook for a few minutes, until leeks have softened. Add artichokes, ½ teaspoon salt, and 1 cup of the liquid. Adjust heat to a simmer, stirring occasionally, until liquid has nearly evaporated, about 10 minutes. Turn off heat and add beans and seasoning to taste, depending on how much salt was in the canned beans. Spread bean and vegetable mixture in a 1.5 to 2 qt. ungreased baking dish, add remaining ¾ cup liquid to almost cover, then top with all the goat cheese. Mix bread crumbs and olive oil and layer evenly over the goat cheese (a 1.5 qt. dish, as pictured, will be full to the rim). Bake about 25 minutes, until topping has browned. Let cool a few minutes before serving. The dish looks nice if the bread crumbs are kept on top when serving, but it tastes best if everything is mixed together, so don't worry too much about perfect scoops. 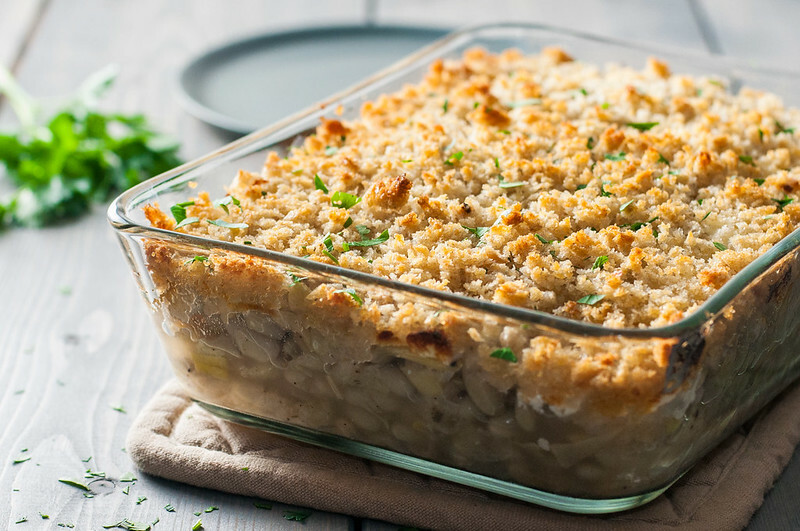 Make ahead by fully preparing the gratin and storing, covered, in the refrigerator for 24 hours. Bake as directed, increasing bake time as needed if the gratin is baked directly from the refrigerator. Nutrition: vegetarian, if goat cheese is free of animal rennet. Note: This page contains affiliate links. It does NOT contain sponsored content. 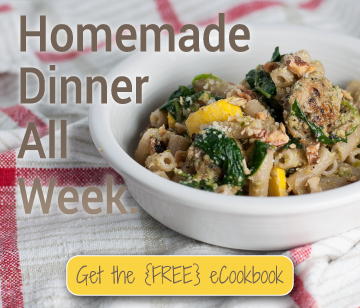 Affiliate links (to products I recommend, on Amazon) offset my ingredient and website maintenance costs, so I can keep bringing you hearty recipes like this one. Thanks! It’s been too long since I’ve made a good gratin like this. 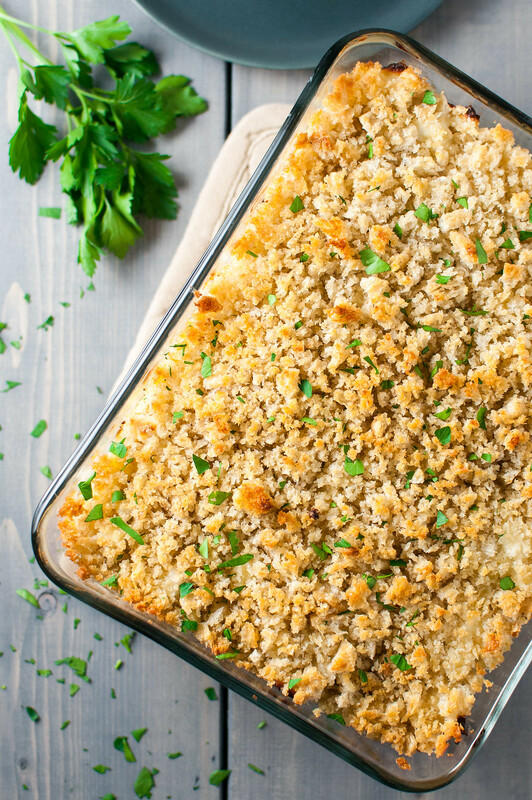 This gratin just screams comfort food – and is ALL I am craving right now! 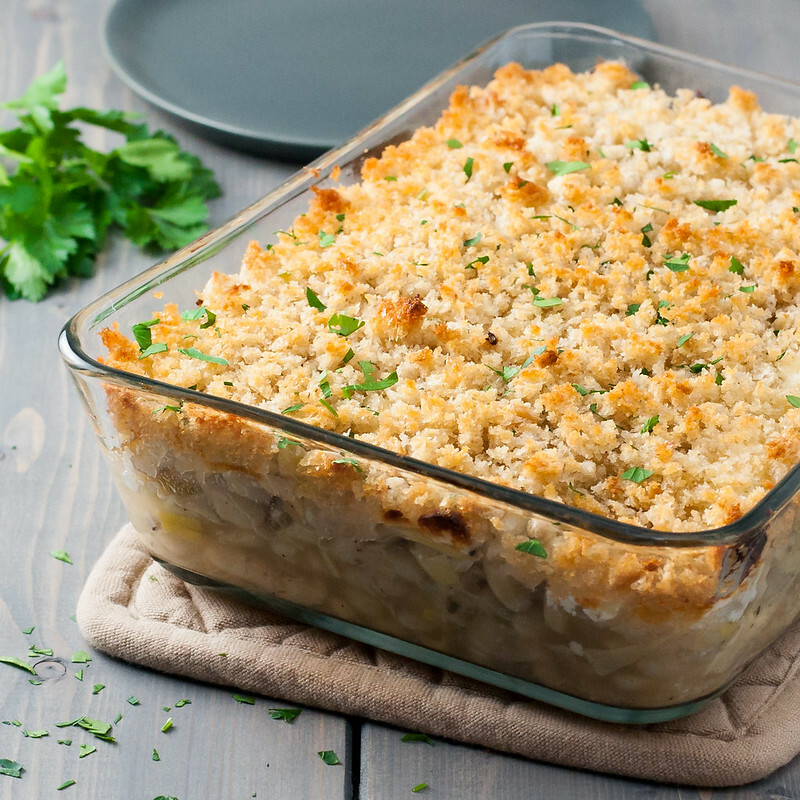 It’s the perfect one to break your gratin dry spell! So much goat cheese goodness. My general take on the “better ingredient” issue is that if the dish is going to be cooked for any appreciable length of time, it’s OK to use pretty standard ingredients. That said, if it’s going to be served uncooked, “better is mandatory.” Life without an occasional splurge is not a life well-lived. Totally agree Lizzie! Exactly the reason I keep a cheap and expensive olive oil…none of the $5 per bottle stuff on my salads or bread!